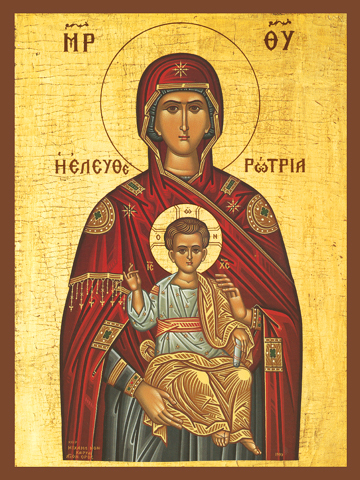 The Greek name Eleutherotria of this icon of the Theotokos, or Birth-giver of God, indicates freedom. Truly the Virgin Mary used her God-given freedom to readily choose not to sin throughout her whole life, and more importantly to intensely love God with all her heart and with all her mind and with all of her soul, and to pray to her Lord to come to her, and come to her He did indeed! This is freedom used wisely, for true wisdom sees things as they really are in all Eternity. We often in our fallen humanity see freedom as an escape from restraint, rather than a plunge into truth and reality that encompasses all of Heaven and Earth: the past, the present, and the world to come as God Himself has revealed it. For self-serving fantasy, this is extremely uncomfortable, but for humble-minded love, this is the expanse of true freedom. Here the Virgin holds her Child as an open invitation for us to make our heart a cave for Christ to be born, for, “the Kingdom of God is within!” Let us wisely choose to follow her example and learn freedom in Christ, which encompasses all things.